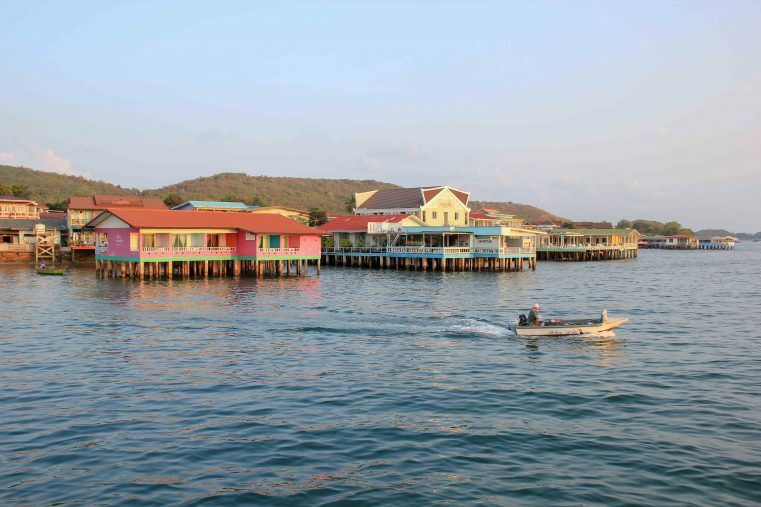 Koh Larn, sometimes written as Ko Lan and better known as Coral Island, is a small island located right in front of Pattaya. With its beautiful beaches and an unbelievable turquoise blue sea, this tiny island is a real paradise on the East Coast of Thailand. 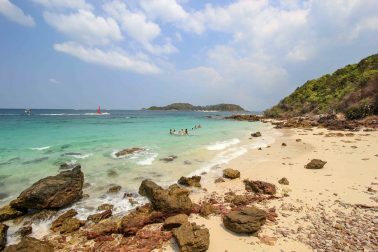 Indeed, the island Koh Larn has become a popular tourist destination and many tourists from Pattaya flock to see amazing place. Fortunately, at night the island is quiet, and you won`t find an exciting nightlife here. Some parts of Koh Larn are still very contemplative and those who knows the right spots and beaches of the island will experience a relaxing and unforgettable holiday. In this blog post we will share all the important information about traveling to Koh Larn, accommodations and the best travel time. 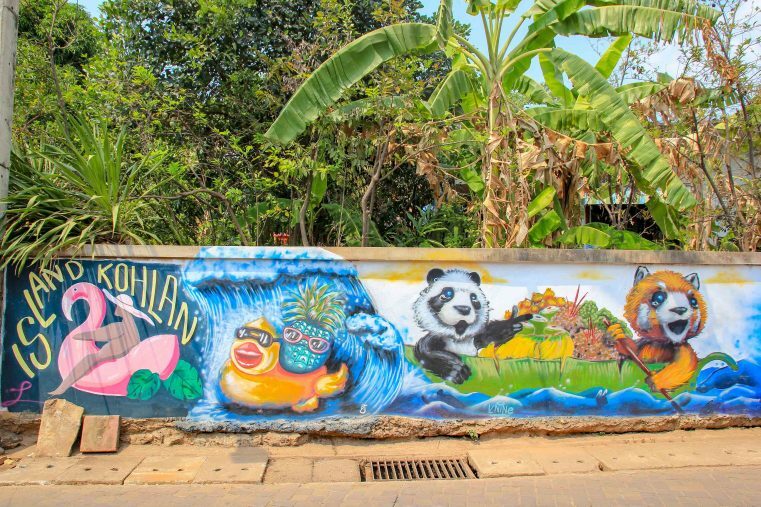 In addition, this Koh Larn travel guide has a bunch of useful tips for visiting the island, where are the best beaches, fabulous viewpoints and the worth seeing temples. Even with its small size of only 5.6 square kilometres, Koh Larn offers some exciting activities and attractions. We were thrilled about the magnificent views, wonderful temples and great beaches. Getting around the island by the scooter or island taxi you will get the opportunity to experience all the beautiful places, away from mass tourism. 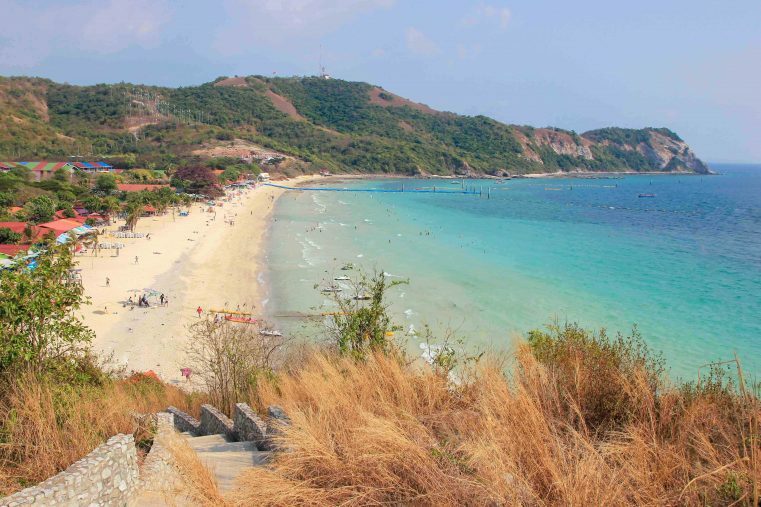 There are plenty things to see and to do at Koh Larn, so a daytrip is really worth it. Also there are amazing places for swimming and snorkelling, you can do kayaking, have a massage or just relax at the beach. For discovering all the beautiful beaches and exploring the island best places it is definitely recommended spending a few nights here! 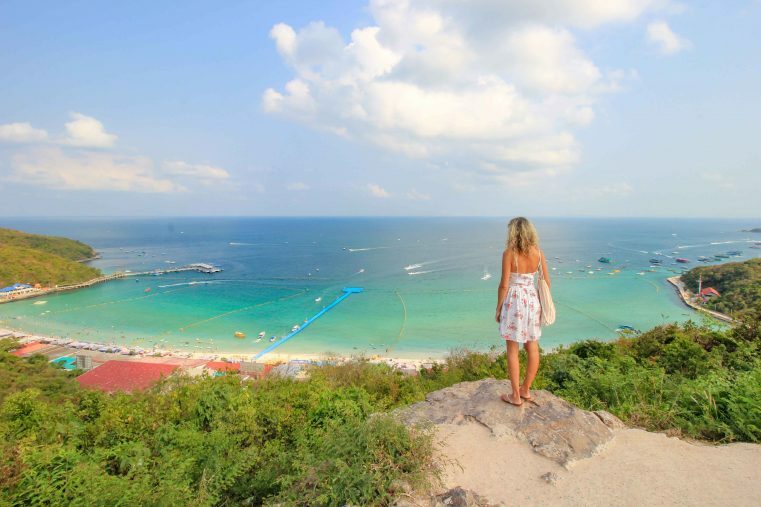 The Kuan Yin Viewpoint is a must see at Koh Larn island and should, if you are already there, be visited. It’s by far the most beautiful view of Koh Larn and it can be easily reached by a scooter tour. 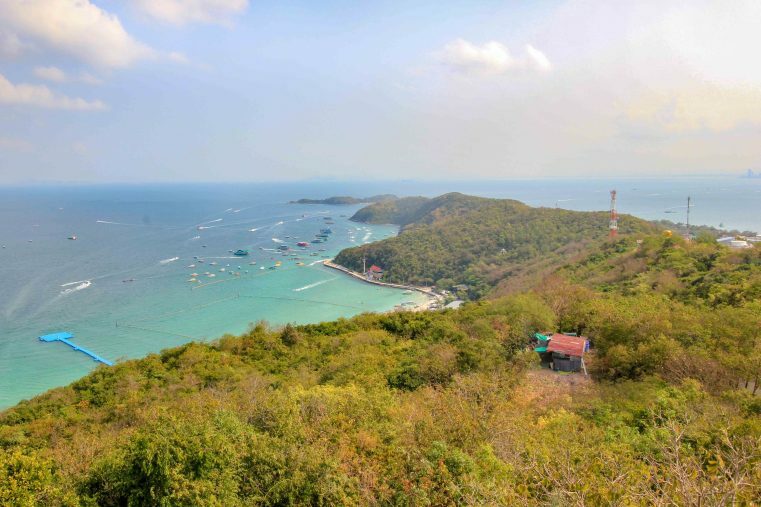 Only a few minutes away, this viewpoint is located centrally between Koh Larn Pier and the main beach (Tawaen Beach). 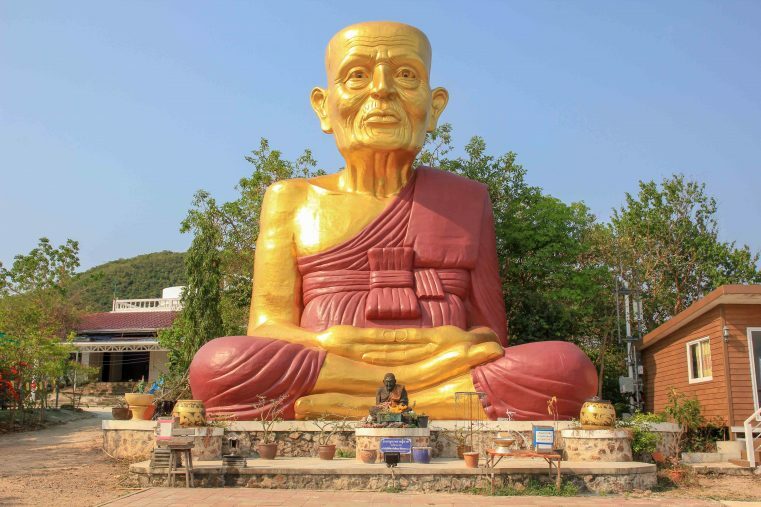 On the way up, you will inevitably pass a giant Buddha statue – one of the main attractions of Koh Larn. This is not only a great photo opportunity, the view down to Tawaen Beach is also overwhelmingly beautiful. A bit higher than the first Big Buddha viewpoint is the famous Kuan Yin Viewpoint. From the parking lot, you have to walk a few meters to cross a temple and to reach the Kuan Yin statue. From there you will have scenic views over the dense forests and the entire northern part of the island. If you are a bit sporty why not hike up the 250 steps to the pagoda at the summit. But don`t go for the view: trees limit the wonderful view over the island. Another beautiful temple is the Wat Mai Samraan. On the small temple areal there are many interesting Buddha statues, colourful decorations and a quiet atmosphere. 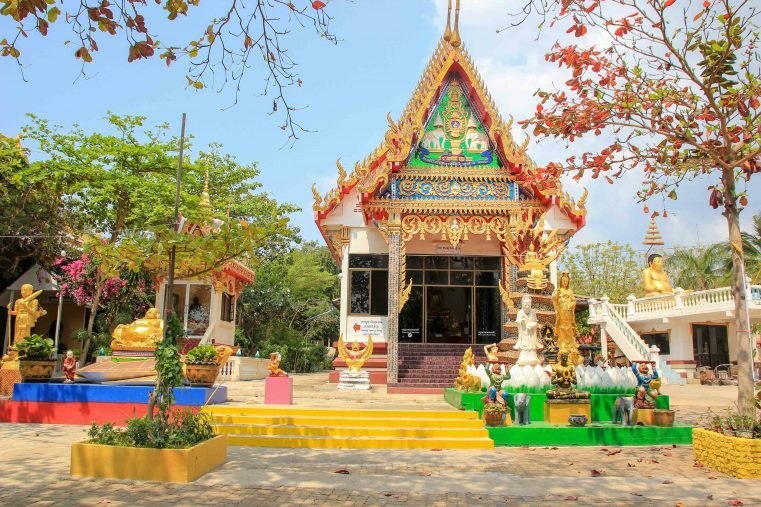 The Wat Mai Samraan is easy to reach within a short walk from Koh Larn Pier, right in the centre of the small village. 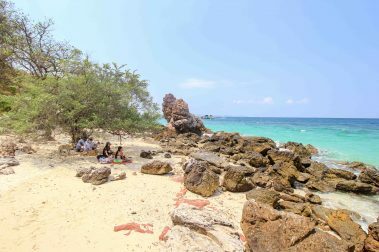 The Ta Yai Beach, or grandparents beach, is located in the north of Koh Larn and is one of our absolute favourite spots on the island. The incredible water colors, the fine sand and the relaxed vibes are simply incredibly enchanting and so the Ta Yai Beach is certainly one of the most beautiful beaches of Ko Lan. If you are looking for a good place for snorkelling, this beach jewel will definitely be the right choice for you. This quiet beach is an ultimate highlight of the island and you should not miss it! Tip: The sunsets at Ta Yai Beach are magical and the location is one of the best on the island! 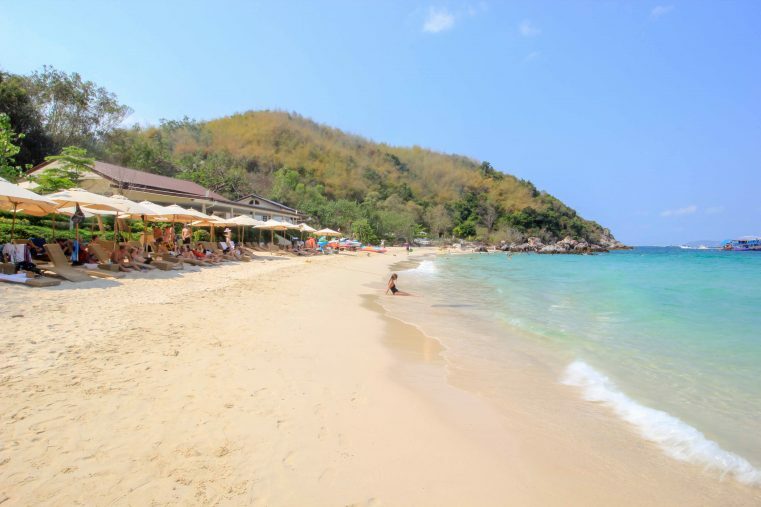 The 700-meter-long Tawaen Beach is the main beach of Koh Larn and it’s the location where all the day trippers from Pattaya are dropping off. The beach is, apart from the masses of visitors, fantastically beautiful and in counts to one of the best beaches of the island. It falls gently into the sea and therefore is ideal for families with small children. There are many activities such as jet ski, underwater walk and banana boat offered. In our experience, a visit is worth starting from 16:00, when the crowds leave the island. Then peace returns and the atmosphere on the beach gets really pleasant. West of the main beach, just next to the Tawaen Pier is the small but beautiful Sang Wang Beach located. The small bay is actually ideal for swimming and snorkelling. Here the sea is crystal clear and under water are some colourful fish to discover. Especially in the early morning, the beach is still pleasantly quiet. Unfortunately, around lunch time it gets really full. 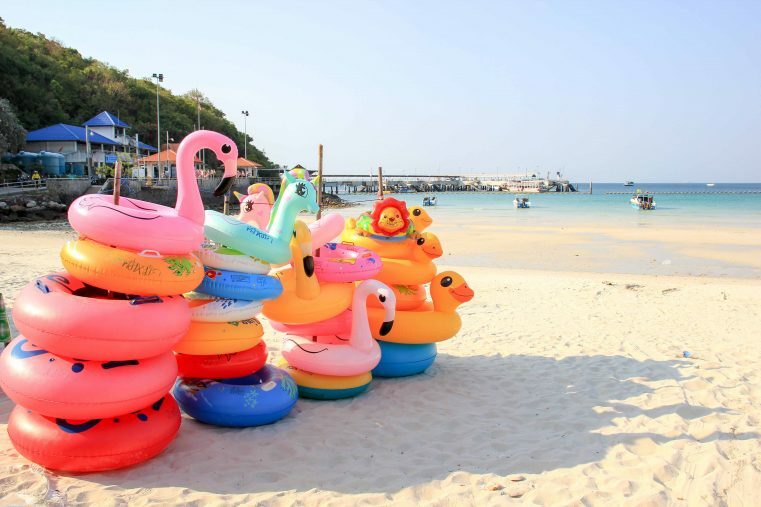 Another recommended beach of Koh Larn is the famous Nual Beach, which is actually better known as the Monkey Beach. Without question, it is one of the most beautiful beaches on the island and is accordingly a little better visited, but still not crowded. Really scenic is the Monkey Rock that is located at the bottom of the beach. If you are lucky, you will have the chance to meet some monkeys over there. Tip: The beaches of Koh Larn usually offer natural shade. Anyway, for only 100 baht per day it’s possible to rent your own beach chair with umbrellas. Another top beach is the wonderful Tien Beach. 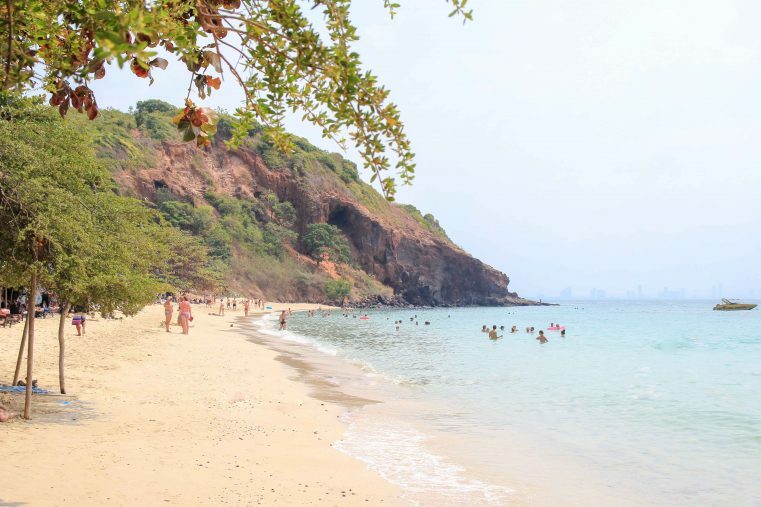 This quiet beach is high up on our list of the best beaches in Koh Larn. The atmosphere is really relaxed, the water is just amazing and the entire location is just scenic. There are also good shady spots and the beach is also great for snorkelling. 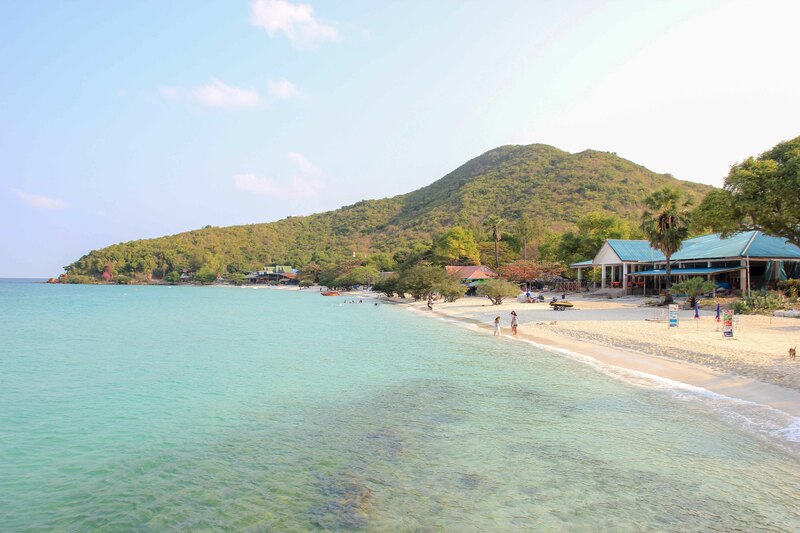 Also the Samae Beach is a must-see place on Koh Larn. The beach is a bit coarser compared to others on the island and is definitely a bit busier. For a perfect beach day we would prefer other beaches, but the view from the Samae Beach Viewpoint is just gorgeous and so a short trip to it pays off in any case. Tip: The best view you will have in the afternoon when the sea colors change to turquoise blue. 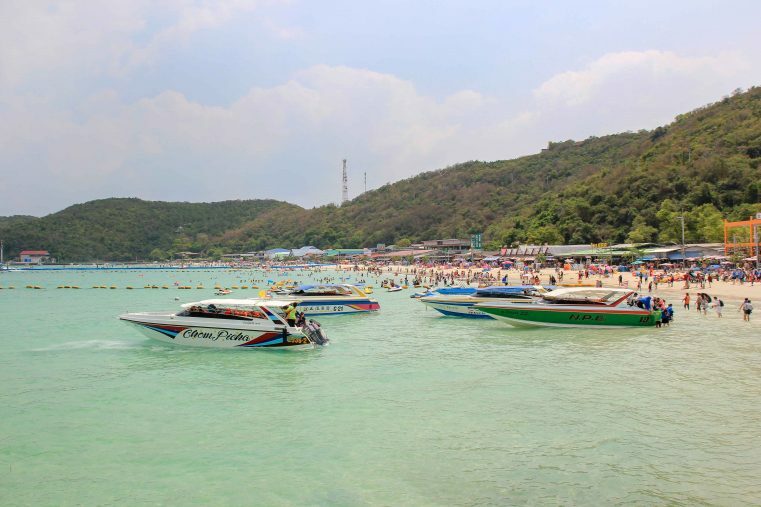 From November to February, the weather at Koh Larn is hot and dry. This travel time is the best, because it only rains slightly, and the humidity is only around 50 percent. The rainy season is from May to October, with very heavy rains in September and October. 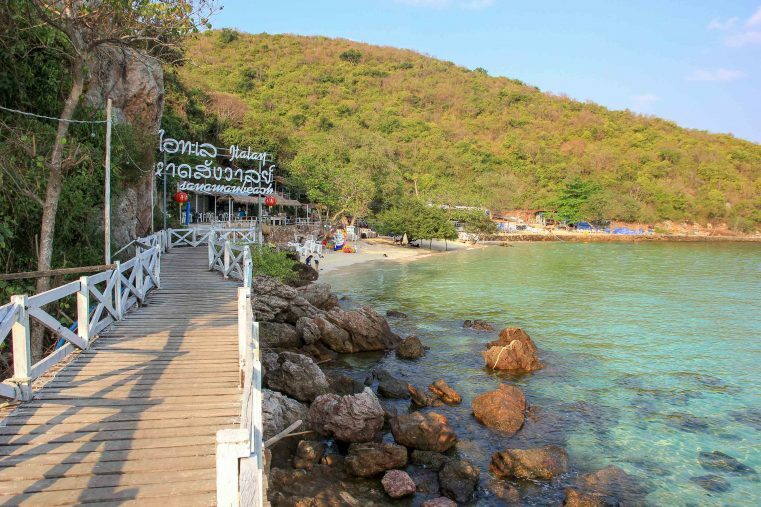 Maybe because of its proximity to the big city of Pattaya, the small island of Koh Larn offers a surprisingly good selection of hip and tasty restaurants. These are mainly found in the capital of the island. 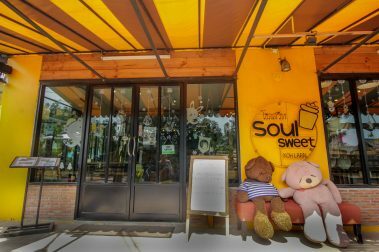 Especially delicious was the food at the Cafe & Restaurant Soul Sweet. 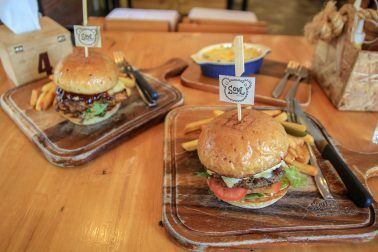 In addition to typical Thai food, great European dishes like delicious burgers are served here. 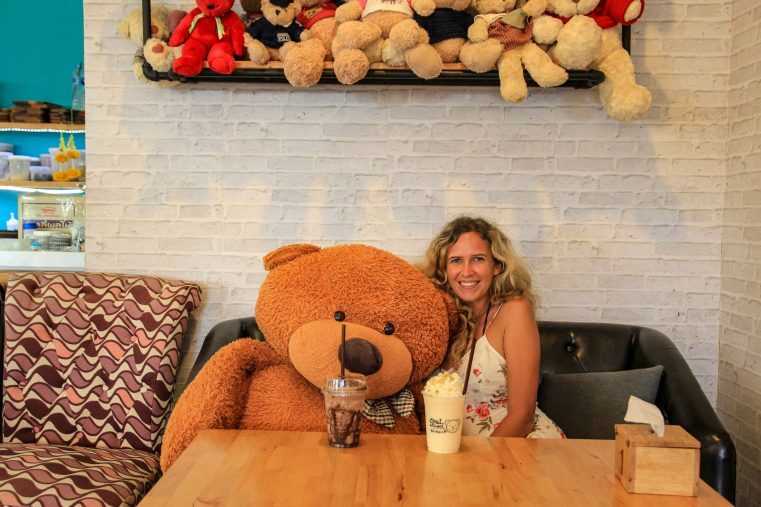 But espacially, people love the cool teddy bear location and the incredibly creative desserts and shakes. For good food we can also recommend the Love on Sea Restaurant and Pizza and Coffee Koh Larn. Where to stay in Koh Larn? Koh Larn you have a good range of simple hotels, accommodation and bungalows. Despite the proximity to Pattaya and Bangkok the prices of the island are not more expensive than on other islands of Thailand. Especially during the week you can find some cheap and good hotel deals. We loved our stay at Koh Larn Sea Side Resort, which is located directly at the sea. This lovely accommodation has large clean rooms, a beautiful balcony and breath-taking views to the skyline of Pattaya. Cheap scooters can be rented here! Highly recommended is the Lareena Resort which is only 30 meters from the pier. This hotel has a top location next to the pier and directly on the sea. Also the rooms are nice and comfortable.